A story about the ultimate sacrifice of a Filipino soldier during war in Marawi City 11has gone viral on social media. 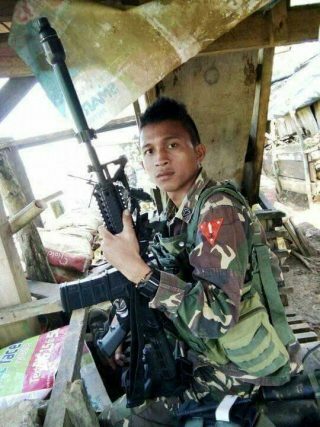 Facebook fanpage Sibugay Express [SiBex], a local news outlet in Zamboanga Sibugay, shared the story of Private First Class Dhan Ryan Bayot, a 24 year old soldier who called his commander before he died in the hands of the Maute-ISIS terrorist in Marawi City on May 24. According to the story titled “A different kind of Bayot”, the team of the private first class consisting of nine soldiers from the 51st battalion was stationed in a Barangay in Marawi Cty on the second day of Marawi siege. They were ordered to be dispatched to the said position upon the request of a town mayor for security purposes as his residence was just above the detachment. But moments later, they were attacked by armed men and a survivor said that the team of private Bayot was ambushed. Several gunfire also came from the mayor’s house which allegedly occupied by the Maute terrorist or maybe some bodyguards of the mayor helped the attackers. Five of Private Bayot’s companions were dead as the result of the ambush conducted by the terrorist. Three soldiers managed to survive the ambush, but later three of them were shot, killing one and wounding the two. Private Bayot, who already cornered by the terrorist called his commanding officer to ask for reinforcement, but no one came to rescue him. A few hours later, he called again but unfortunately, Prvt Bayot has been told by his commanding officer that reinforcements attempted to enter his area twice, but they couldn’t get through as the way was already blocked by heavily armed terrorists. 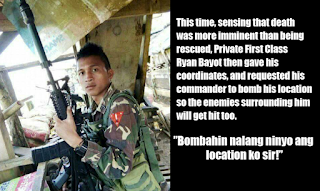 After he realized that he cannot survive the ambush anymore, Private Bayot gave his coordinates to the commanding officer and asked him to bomb his own location so the terrorists near his location would get hit. “Bombahin nalang ninyo ang location ko Sir!,”(Just bomb my location Sir!) he told his commanding officer. After the call ended and Private Bayot didn’t call his commanding officer anymore and the army assumed that the young soldier already sacrificed his life for the country. Four days later, his dead body, including the body of his comrades was retrieved by the army. One of the people who retrieved the body of Private Bayot is Sgt. Larry Bayot of the Division Reconnaissance Company of the 1st Infantry Division, the father of the Prvt. Ryan Bayot. Sgt. Larry Bayot saw no bullet wounds on his son’s body. Instead, he saw his son’s heavily deformed face and a deep bolo cut around his neck, a sign that the Maute terrorist group attempted to behead Private Ryan Bayot. Although pained so much for the dastardly manner of his son’s death, he never showed it. To a soldier, it’s always a ‘do-or-die-but never-question-why’ attitude. The next day, the father brought his son’s body to bury him in the Family’s hometime in Ipil Zamboanga Sibugay. 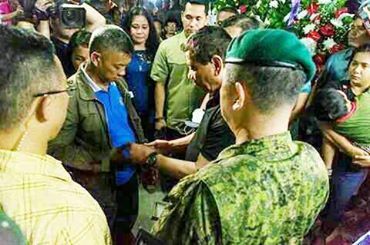 On June 2, President Rodrigo Duterte visited the burial of the young soldier and personally give the posthumous medal to Prvt. Bayot’s father. The President also gave ₱250,000 to Bayot family and also pledged to support the education of any young surviving member of the family. President Rodrigo Duterte visited the burial of Prvt. Bayot and personally gave the posthumous medal to Sergeant Bayot. When President Duterte asked if Sgt. Bayot has additional request, he told his commander-in-chief that his other son, the younger brother of Private Bayot wanted to enter the Armed Forces of the Philippines. But the President gave an advice to the sergeant to let his remaining son finish college first. “Unsa pa man akong matabang nimo?” (What else can I be of help?) the President asked Sergeant Bayot. Bayot replied that his 18 year-old youngest son, who is the late PFC Ryan’s younger brother, wants to join the Army too. Maybe you can help him enlist in the army, Bayot told the president. Sergeant Bayot followed the advice of his commander-in-chief. Now, the younger brother of Prvt. Bayot will be off to college. His expenses will be shouldered by the government. “Ironically, the word bayot in Visayan means gay.But for this particular family and for the neighbors who knew them in Upper Pangi, Ipil, the word now simply means valor and patriotism.” SibEx wrote in the last part of their post. As of June 6, those killed include 134 terrorists, 38 government troops and 30 civilians, Brig. Gen. Restituto Padila, Armed Forces of the Philippines (AFP) spokesperson, told the reporters. The AFP wanted to finish the Maute Siege on June 12, so the celebration of the independence day for the Marawi residents will become memorable.